Abstract: Up to now, the take-off stage remains an elusive phase of insect flight relatively poorly explored compared to other maneuvers. An overall assessment of the different mechanisms involved in the force production during take-off has never been explored. Focusing on the first downstroke, we have addressed this problem from a force balance perspective in butterflies taking-off from the ground. 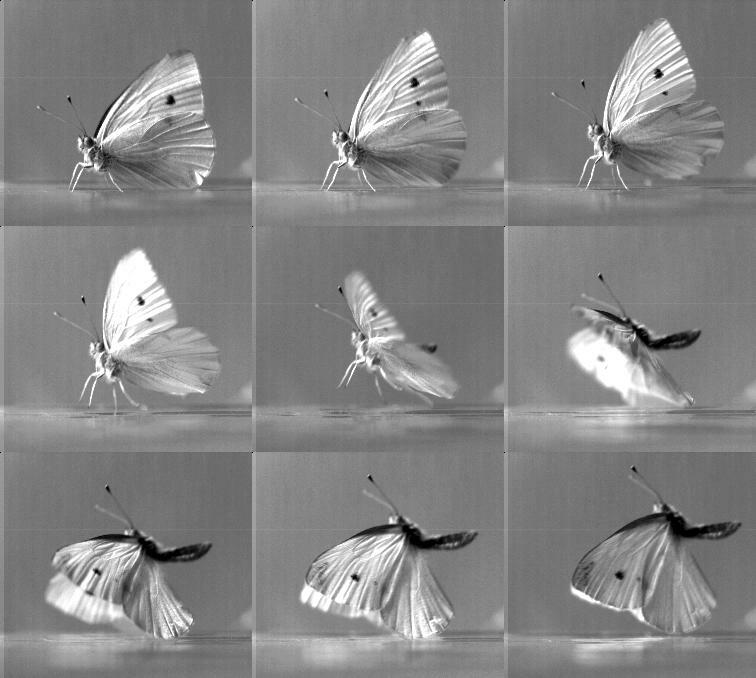 In order to determine if the sole aerodynamic wing force could explain the observed motion of the insect, we have firstly compared a simple analytical model of the wings force to the acceleration of the insect’s center of mass estimated from video tracking of the wing and body motions. Secondly, the wing kinematics has also been used for numerical simulations of the aerodynamic flow field. Similar wing aerodynamic forces were obtained by the two methods. Both are however not sufficient, nor is the inclusion of the ground effect, to predict faithfully the body acceleration. We have to resort to the legs forces to obtain a fitting model. We show that the median and hind legs display an active extension responsible for the initiation of the upward motion of the insect’s body, occurring before the onset of the wing downstroke. We estimate that legs generate, at various times, an upward force which can be much larger than all other forces applied to the insect’s body. The relative timing of leg and wing forces explain the large variability of trajectories observed during the maneuvers.